Sky Blue Sky is the name of Wilco's sixth album. 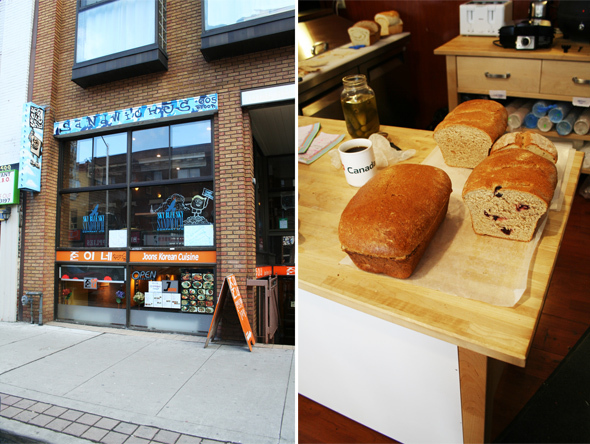 It's also the name of a cozy sandwich shop on Bloor Street West, right in the heart of Koreatown. 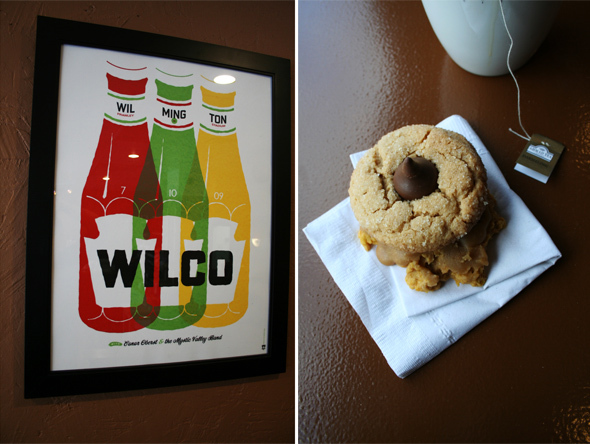 When owner Chad Comfort decided to open up shop last fall, he settled on the Wilco-theme by chance. And now all of the sandwich names on the legal-paper-sized menu are affectionately named after Wilco songs, from "We're Just Friends" to "Hoodoo Voodoo." The counter is lined with loaves of fresh bread and plates of cookies. Chad bakes all of his bread and cookies ($1.25 each) fresh every day and also makes all of his soups from scratch. On the day I visit, there are four listed on the chalkboard, and I opt for the Boston seafood chowder while my chum orders the "Chicken and Rice Flu Chaser" ($3.79 for each 10 ounce bowl). After some time contemplating the menu, we order "Side With The Seeds" ($4.29) and "How To Fight the Loneliness" ($4.99). At a small wood table by the window, I tuck into my hearty chowder, generously flecked with morsels of salmon, salty bacon and vegetables. The creamy broth is flavoured with white wine and herbs. The chicken and rice soup almost resembles the texture of congee, and true to its "Flu Buster" name, it's spiced with ginger, cumin, cinnamon and garlic. Our sandwiches arrive promptly to the table, the bread toasty and hot. "Side With The Seeds" contains slices of thick cheddar and caramelized onions, slathered in saucy roasted tomatoes between two slices of cheese bread. The simple white loaf is dense and swirled with cheese and the crust is sweet and flavourful. "How To Fight Loneliness" contains slices of chicken, apple and bacon. The crispy green apple counters the saltiness of the meat and the toasty naan-like bread is floury and sweet. Both sandwiches are served with dill pickles on the side. But what makes the Sky Blue Sky experience a good one isn't just the crust on the breads, it's Chad himself. Kind and jovial, this entrepreneur delights in accommodating his customer's tastes and requests. The menu also allows you to create your own sandwich ($4.99), choosing from one of the nine freshly-baked breads that include cranberry cream cheese, plain bagels, and a vegan-friendly loaf as well. Fillings include another list of nine, including five kinds of meat and three kinds of cheese -- you can pick up to four of the nine filling options. Garnishes include everything from sweet pickles and roasted red pepper spread to barbecue sauce. Vegetables include cucumber, lettuce, mushrooms and more. Customers can preorder online via email, noting choice and pickup time. Online orders also benefit from a 5% discount. At this bright and homey spot on Bloor West, it's blue skies for your wallet even if you don't order online. 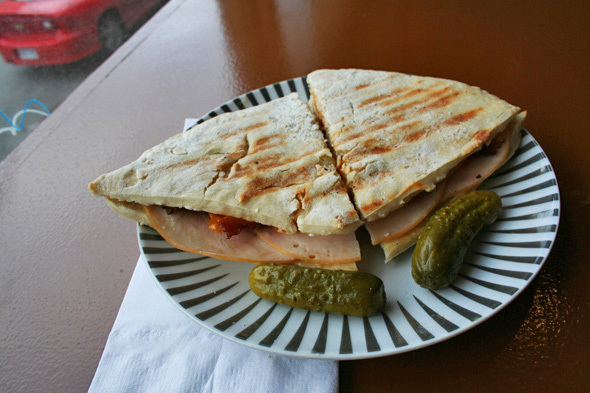 Sandwiches are all under five dollars, and the addition of the soup brings it to just $6. 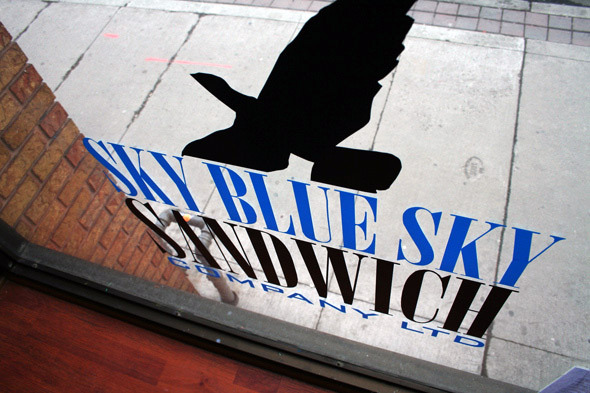 In a city where it's hard to come by a decent meal under $10, Sky Blue Sky is a breath of fresh air.